Along with most people in the caravan park, we left Port Augusta bright and early – on the road shortly after 8.30am. 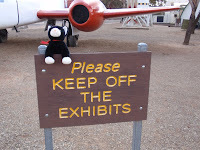 We only had a two hour drive north to Woomera, which did take a bit longer, given the number of photo stops on the way. 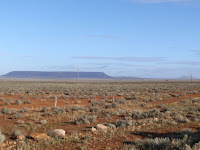 We are definitely “outback” now and in the desert - red dirt, salt bush, low scrubby trees at times, and caravans galore! I think 80% of the vehicles on the road are either towing a caravan or are motor homes. We are also back in road train territory. The country is so different from what we have seen so far – flat, stony at times and with large hills/mountains in the distance rising out of the desert. A few hills gave us a view at times, including a couple of large salt lakes with water in them. The road, of course, has very little bends and the trains are very long. 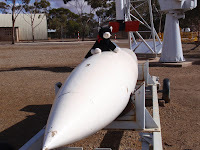 Woomera is an interesting little town, actually a Defence Department base without a guard house at the entrance. About 300 people live here and work for the Federal Government, and there are probably that many tourists as well. There is a rocket park set up with lots of rockets (naturally!) and a very good information centre, which was well worth a visit. Cat was allowed out of the caravan today as there isn’t a winery in sight. 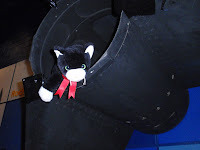 He was a bit hard to control though, once he spotted the rockets! There is even a six lane bowling alley, built by the Americans when they were here in the 1980’s. Cat was not allowed anywhere near this. We had fine weather today, although very windy. It is now raining again!!! Still raining here - I presume you have the warmth which we don't. You'll have to teach The Cat to read!